Next letter up for the A-Z challenge of Positive Personality Traits is Q - and Q is for Quirky. This was a trait a little bit out of left field. I'm sure there was a more sensible one I could have chosen, but I truly believe that quirkiness is something we should all aim for - it reflects our individuality. As a young thing I was all about fitting in with the crowd - wearing the "right" clothes, saying the "right" things and generally keeping within the status quo. As the years have passed me by I have come to realize that blending in and being beige is not the ideal. I am finding my voice again and discovering all the elements that are intrinsically my own. Why would I want to swap that for being like everyone else? 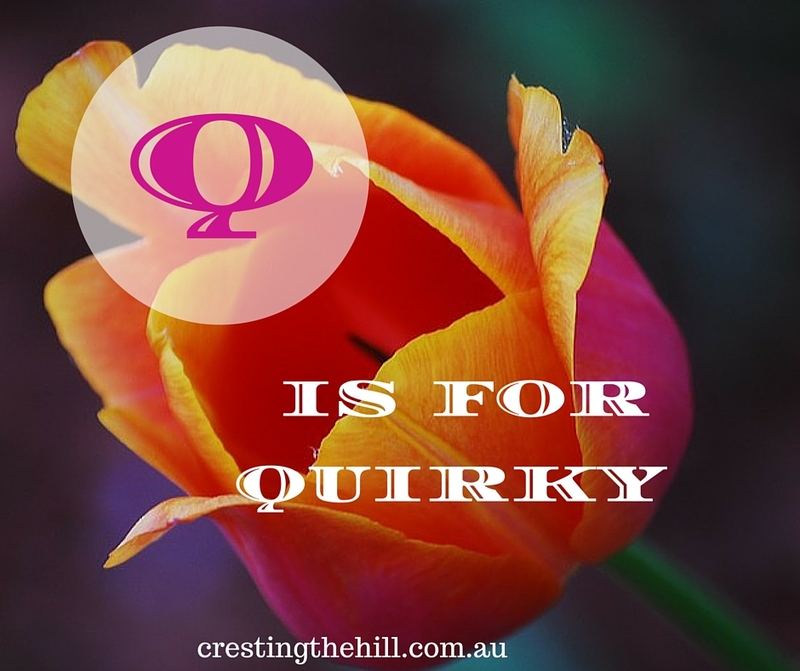 Quirkiness is where we each have our individual special traits. I love meeting someone who so comfortable in their own skin that they can wear something weird, or dye their hair a strange colour (or cut it off, or dreadlock it, or whatever). People who write poetry, or sing songs out loud, or dance to the beat of their own drum. People who are not afraid of being themselves and who don't care if they are being judged. Life is teaching me that nobody judges you half as harshly as you judge yourself. Nobody is really looking all that hard at you and nobody cares if you are a "bit out there". Most people admire a little bit of free-spiritedness (as long as it doesn't impinge too heavily on their own little world). So let's embrace our idiosyncrasies and shine our lights and be a tiny bit quirky. Be proud of who you are and what you like - who knows, you might even create a new trend! See you next time for the continuation of Positive Personality Traits - R is for Relaxed. 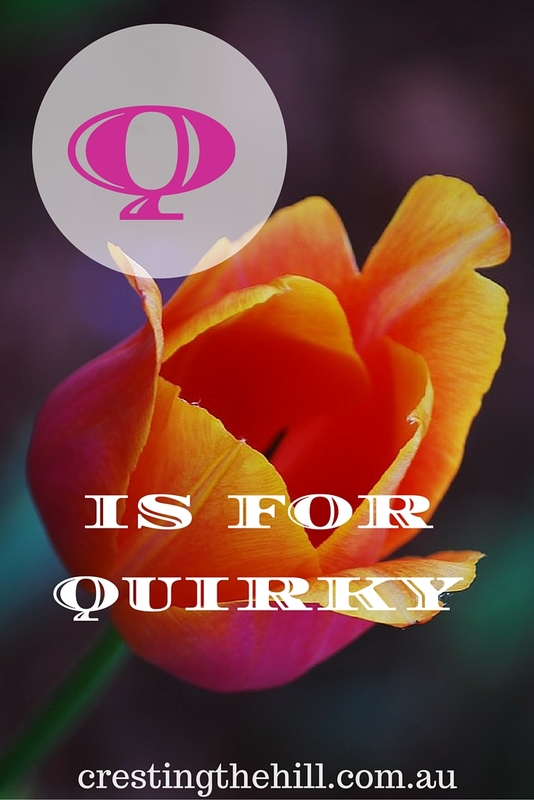 I love the word "quirky" - it just makes me smile. It has taken me a very long time, however, to learn to embrace my uniqueness rather than wanting to always fit in. I fully agree Leanne, being yourself is way better than blending with the crowd. Nobody really cares so much to wonder whether you are all prim and proper and like you said a little quirkiness helps you stand out and looked up to! A lovely take on Q! It's a lesson I'm learning Kala - one benefit of getting older is that you care less about fitting into other people's expectations - midlife is for quirkiness! I like quirkiness in other people - like Chef Anne Burrell and her crazy hair, and women who can wear vintage clothes and cat-eye glasses, and women who rock that Bohemian style of dress. I just can't get all parts to come together in one quirky package so I play it safe. Yes, I have both a husband and son who are quite quirky, which is what makes them unique. I've come to embrace my own quirkiness thanks to them. Wonderful post. I love the idea of an entire quirky family Robin - you can all support each other and bounce off the weirdness - it all sounds like fun! I love that you chose the word quirky. I've been quirky all my life, but of course until I got older I didn't realize how valuable that was. When I was younger I always tried to fit in, and couldn't quite get there, so I always felt a little less-than. Now, I might be a little self-conscious, but for the most part I really just don't care what other people think. As you get older, you are correct, you find out what's really important. And when I break out into a dance or a song, it may embarrass my children to death, but it's just part of who I am. LOL someday they'll get it, right? Stay quirky my friend.